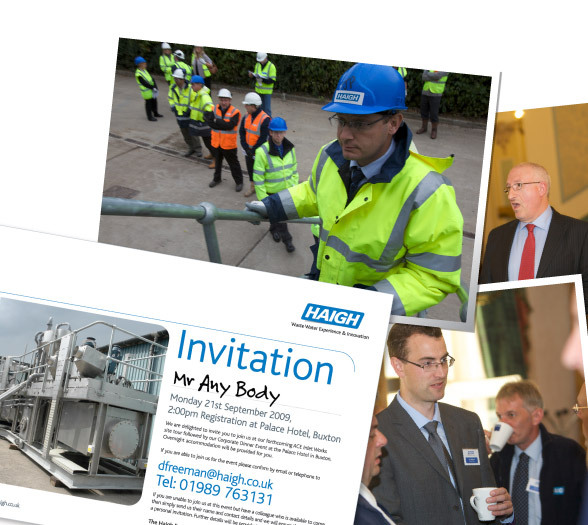 Haigh Engineering needed to launch an innovative new product, ACE Inlet, and wanted an event which their guests could attend and see the product in action at Bakewell Waste Water & Sewage Works (Severn Trent). However, how do you turn this into an event that draws decision makers and influencers in? After researching and reviewing competitor events and establishing what key components needed to be included into an event to guarantee the right kind of audience, we proposed that the site visit was to be followed by hospitality at a nearby venue, with guests comprising; existing and prospective customers, distributors, journalists and Haigh representatives. Having found a suitable venue not far from the Bakewell site, we organised and managed transport, drinks reception, menu and private dining, accommodation, water industry guest speaker, photography, product literature and promotional merchandise for 20-25 people within a set budget. As one of the first of its kind in the water industry, the event was extremely well received by guests and our clients alike – the Bakewell site visit was a particular hit, as it enabled potential customers to see the ACE Inlet in full operation whilst accompanied by Haigh Technical Representatives. The event has generated invaluable leads for the Ace Inlet, with a number of open enquiries – any of which, when closed will present a fantastic ROI for Haigh. Luke Shepherd, Haigh’s Managing Director, was pleased with the uptake of the event, describing it as ‘highly professional’. Haigh were impressed with the opportunity it presented to showcase their innovative products and technical approach to manufacturing and services.